Hello, I am Karen Mayfield life coach former Mars Venus facilitator. Eighteen months after my late husband suddenly passed away I decided I was ready to find love again. I still had a lot of living to do and I really liked being in a relationship more than being single. I wasn’t looking forward to the traditional dating scene and lot of my friends had met the love of their life on the dating sites. SO, I thought I would throw my hat into the ring. When I wrote my profile and posted my picture I used a lot of the techniques I had learned from my days as a Mars Venus relationship facilitator. I was online less than 30 days and met the perfect guy for me. You can to… We have loaded this course with enough content and information to help you find Ms. or Mr. 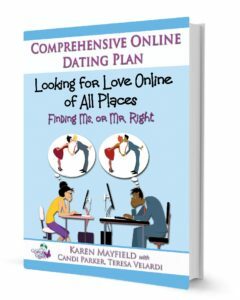 Right There are a lot of avenues available for finding love the more you know about these avenues the faster you get exposed to a much larger dating pool come on in have a good time, learn some very strategic tips, techniques, and topics…while looking for love. Once upon a time love stories used to go like this. Girl sees boy; their eyes meet from across a crowded room. Smiles are exchanged and a bolt of electricity flashes across the room. Cautiously one approaches the other with a clumsy or charming conversation line running over and over in their head. Then the introduction is made, and a conversation begins. Here are some facts to consider when deciding if online dating is for you. Present day online dating sites and dating platforms enable people to meet and fall in love who would never have known the other existed without the technical capabilities of the World Wide Web. With over 1,500 dating sites and dating apps and 40+ million American singles heading online to find love, the online dating options are endless. Pew Research had a recent study that looked into the percentages of people in the US who have used dating sites and found that 5% of marriages in the US are by people who met through online dating. The numbers are there online dating has grown from a new way of dating to becoming the second most popular way to meet. Maneuvering through the world of dating has always been unpredictable but with the invent of online dating it’s a whole new game of love. Never mind if you are a Newbie to online dating or experienced at it, even the Serial online dater will gain valuable insights. We put together this entire multi-media experience to work for everyone, regardless of race, preferences, religions, or locality. It all starts with your profile. Creating a message that is clever, but not creepy takes talent. What is the best approach when you are creating your profile? What is the best picture? How long should you converse before you decide to meet? How do you make sure you don’t move to quick? So, when is the right time to take the plunge and ask for a date? We help you to discover and uncover writing methods used by the top selling authors. Knowing these secrets alone will help your profile stand above the crowd. A picture may paint a thousand words… BUT…Did you know; if the real you do not resemble the photo in the profile those thousand words become one thousand unfavorable perceptions of you. It’s easier to get the first date than it is to make it to the second, so be authentic. BE YOU. “To much too soon” is as bad as “To little too late”. The most comprehensive dating course. We help you navigate the world of dating from the first date to the wedding day..